Considered Edmonton’s most prized asset in annual surveys of residents, the river valley parks system and natural areas are key to our quality of life. Combined with playgrounds and sports fields, trails and neighbourhood open spaces, Edmonton has a wide range of active recreation and leisure opportunities. Parks add beauty to our city, provide a respite from our busy lives and help us connect with nature. Each year between 400 and 500 capital projects are moved forward to enhance the city’s parks. These projects range from between $10,000 to as much as $28 million and are often completed in partnership with other government community organizations or the private sector. Construction of the signature Fort Edmonton Footbridge and Trails, which spans the North Saskatchewan River from Fort Edmonton Park to the Westridge and Patricia Heights neighbourhoods (completed 2010). Construction and initiation of major components of the Louise McKinney Riverfront Park. The riverfront promenade has been completed, the green room is in progress, and the riverfront buildings has completion scheduled for 2013. Construction of the Terwillegar Park access road completed in 2011. New neighbourhood park construction completed in Terwillegar East, Rutherford, The Hamptons (2), Silverberry, Leger, Carlton, Hudson, Summerside and Tamarack Green. Rehabilitation of Jackie Parker Park (playground and water features - completed in 2010). Redevelopment of Kinsmen Park Wading Pool (completed in 2011). 87 neighbourhood parks and outdoor aquatics were built or upgraded across 73 neighbourhoods. Park amenity projects such as pathways, lighting, shade structures and community gardens in nine neighbourhoods. Callingwood District Park spray park (completed in 2011). The site plan for redevelopment of Borden Park was completed with construction commencing in 2011. John Fry Park redevelopment is also under construction with completion anticipated in 2013. The new amenity buildings in Whitemud Park are largely completed with opening dates scheduled for December 2011 and the spring of 2012. 10 River Valley partnership projects with groups such as Huskies Football, Snow Valley, and the Edmonton Queen were completed. Four “in progress” park development projects are to be carried forward for completion in 2012. Park renewal to complete John Fry District Park, Borden Park and Mill Woods District Park redevelopments. Neighbourhood parks and outdoor aquatic amenities renewal. Parks and playground conservation (focused on component replacements and urgent repairs). River valley renewal to include Victoria Park Amenity Building and upgrades to Laurier and Buena Vista Parks. Valley Attractions (Terwillegar/Centennial Lands trails and footbridge). 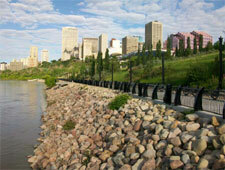 City Centre (West Rossdale Projects); and Valley Parks (trails connections to the east Anthony Henday Bridge).